This past week Center Consolidated Schools had a tremendous opportunity to share its focus on the arts with the entire community. On Tuesday evening Center Schools Instrumental Music Director Kate Newmyer’s 5th through 12th grade program conducted an outstanding winter performance for the community. 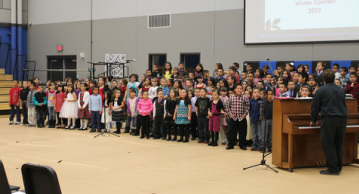 On Thursday Haskin Elementary School Music Teacher Gabriel Swanson entertained our parents with a fine performance of Christmas music by students in grades K-4. On Friday and Saturday evening a wide range of Center Schools students displayed their talents as the Drama Club, led by Haskin Elementary School 4th Grade Teacher Zoraya Vazquez and Center Schools Classroom Paraprofessional Allan Alsup, staged a performance of Hansel and Gretel; the Untold Story. This gave many of our children the opportunity to display their acting, stage design, sound, lighting and costume design talents. Add all of this to our regular grade 6-12 Visual Arts program, our Graphic Art Design and Video productions offerings taught by Center High School Teacher Dennis Schoenfelder, a college level Art History class taught by Mrs. Newmyer, a brand new Photography class taught by Center High School Art Teacher Lauren McEvoy, and a Culinary Arts program supervised by Center High School Teacher Brandon Selby, and you can see Center Schools finds itself perched right at the "intersection of Art and Technology." On Monday evening we’ll all have one more opportunity to enjoy the talents of our students as the Center High School Alternative Music Class performs in the district auditorium. On Monday the entire administrative team met in the administration building to work on mid-year teacher evaluations. 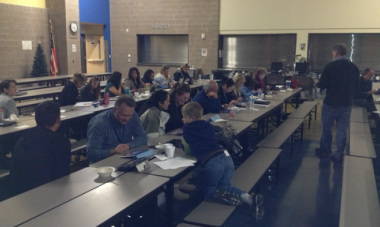 On Monday evening many dedicated Center Schools staff members extended their work day to view a presentation by the Apple Computer Company on how iPads can be used to deliver quality classroom content to students. Later that evening High School Counselor Katrina Ruggles offered a session to Center High School parents on how to submit a FAFSA application for students who intend to go to college. On Tuesday I attended the monthly San Luis Valley Superintendent’s Advisory Council meeting at the BOCES building in Alamosa. This was followed in the afternoon by a regional secondary and elementary principals meeting at the Alamosa School District Board Room. On Tuesday evening we also learned that the San Luis Valley school districts were awarded an IDEA grant worth 1.5 million dollars over the next three years. This grant should go a long way toward helping us to keep our current Lindamood-Bell intervention program in place. On Wednesday I travelled to Denver to attend the CEA, CASE, CASB Anchor Group Meeting. I stayed overnight in Denver to attend the final School Finance Technical Advisory Group meeting on Thursday. At this meeting we learned about eh various options available to increase revenues for K-12 education funding. On Friday I spent the day writing and submitting a Colorado Legacy Foundation Extended Learning Opportunities grant that would allow San Luis Valley districts to establish and learn lessons from 16 pilot iPad classrooms. If we become a finalist for this grant we’ll have a site visit by the Legacy Foundation in late January. This past week we focused our efforts on mid-year teacher evaluations and our annual financial audit. Our audit by Wall, Smith, Bateman went well, showing we had an actual end of fiscal year General Fund balance of $459,718. We did have one audit finding, an issue many small school districts in Colorado deal with related to the size of our business office staff and the lack of internal controls this situation creates. I want to thank Center Schools Director of Finance Betty Casanova for doing a great job in getting our books closed and audit completed in such a timely fashion this year. Our third Core Belief states that “quality planning, instruction, and assessments lead to high achievement for ALL students.” Center Schools teachers live up to this by effectively planning lessons aligned to state standards on a weekly basis. 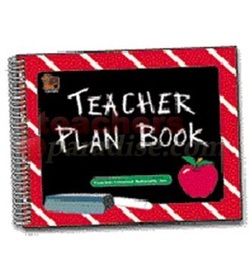 Center Schools administrators live up to this core belief by reviewing teacher plans on a weekly basis to ensure they are effective and aligned to state standards, and by offering feedback for possible improvement. After recently travelling around the state of Colorado and meeting principals from many regions I have grown to appreciate just how rare it is that this work is done in a school district. I would estimate that less than one in ten school districts put such a focus on this kind of effort. Add to this the fact that Center Schools teachers work to intentionally engage all students in their lessons, and measure student growth quarterly by administering tests aligned to standards, and you can see why our kids are growing at a rate faster than the state average. Monday will be a routine day in the district though we do have a special board meeting at Noon to address a student matter. On Tuesday Center High School staff members will be at the State School Awards Ceremony in Denver to receive another Centers of Educational Excellence Award. I’ll report more on this next week. Tuesday is also the last day of school for the first semester for students, as they will embark on a winter break from then until Monday January 7th. On Wednesday and Thursday Center Schools Teachers will be engaged in Kagan Cooperative Learning training as a follow up to efforts we are already making to support teachers with tools to engage more students in lessons. Friday is an end of semester teacher workday and the Center Schools staff Christmas party. As you all know the nation was once again saddened by the news of a senseless mass attack on its citizens this past week. 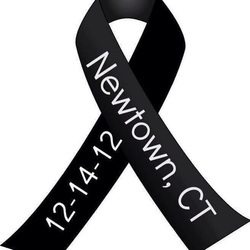 Unfortunately the events that took place in Newtown, Connecticut hit extremely close to home for all of us in Center Schools because this time the target was public school children, teachers, and administrators. Words can not heal the pain that is being felt, nor are they very good when trying to explain why such things could happen. However, as lifelong educators we can all be extremely proud of how the staff members of Sandy Hook Elementary School conducted themselves in response to the tragic events that took place last Friday. Teachers and administrators heroically confronted the shooter. Classroom aides and teachers courageously protected then shepherded children to safety. None of us can be truly prepared to react to such events. If nothing else the educators of Sandy Hook showed us all how it can be done under such trying circumstances. In the mean time I would like to offer some words regarding how we might support our children when it comes to dealing with such scary events. First, encourage children to talk about their concerns and to express their feelings. Some may be hesitant to initiate such conversation, so you may want to prompt them by asking if they feel safe at school. When talking with younger ones remember to talk on their level. For example, they may not understand the term “violence” but can talk to you about being afraid or a classmate who is mean to them. Talk honestly about your own feelings regarding school violence. It is important for children to recognize they are not dealing with such fears alone. Validate the child’s feelings. Do not minimize a child’s concerns. Let them know that serious school violence is not common, which is why these incidents attract so much media attention. Stress that schools are safe places. In fact, recent studies have shown that schools are more secure now than ever before. Empower children to take action regarding school safety. Encourage them to report specific incidents such as bullying, threats, or talk of suicide by other individuals, and to develop problem solving and conflict resolution skills. Encourage older children to actively participate in student-run anti-violence programs. Discuss the safety procedures that are in place at your child’s school. Explain why visitors sign in at the principal’s office or certain doors are to remain locked during the school day. Help your child understand that such precautions are in place to ensure his or her safety and stress the importance of adhering to school rules and policies. Create safety plans with your child. Help them identify which adults (a friendly secretary, trusted teacher or approachable administrator) your child can talk to if they feel threatened at school. Also ensure that your child knows how to reach you (or another family member or friend) in case of crisis during the school day. Remind your child that they can talk to you anytime they feel threatened. Recognize behavior that may indicate your child is concerned about returning to school. Younger children may react to school violence by not wanting to attend school or participate in school-based activities. Teens and adolescents may minimize their concerns outwardly, but may become argumentative, withdrawn, or allow their school performance to decline. If you see this kind of behavior please be sure to contact school staff so we can become aware of it. On Saturday December 15th Center High School enshrined Jimmy Bevan in its Athletic Hall of Fame. Known by all for his tremendous character and humble nature, Bevan was also a great athlete and a great sportsman who earned Colorado State Champion honors in the triple jump event in 1979.
, 2008 Conference USA Outdoor Coach of the Year. Additionally, as an athletic recruiter for Rice University Jimmy Bevan has always had a special eye out to help San Luis Valley students to get into college, often encouraging his coaching colleagues to offer Valley students an opportunity to gain a college education. Congratulations to Jim and his wife Vicki. They both reside in the Houston area. We learned this morning that Mary Lou Fyock, the namesake of the Center Schools Fyock Community Library, passed away on Monday morning as the result of a stroke. Mary Lou was a proud, life long Center resident who served the children of our community as our district Librarian for more than 30 years. Generations of students grew to love literature under her tutelage. 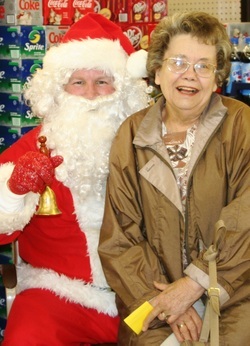 After retiring in 1996, Mary Lou stayed engaged with the school, remained a proud Viking alumnus, and approached life in a manner in which she simply never had a disparaging thing to say about anyone. Our collective prayers go out to the entire Fyock family at this time. Mary Lou’s presence in Center will truly be missed!